This is a lovely 60 minute combination of gentle flow and yin yoga that opens and strengthens the body, while also calming the mind. Gentle flow is a meditative practice that offers mindful movement that is linked with the breath. Yin Yoga is a relaxed practice of floor postures that are held from three to five minutes targeting the deeper connective tissue, including ligaments, joints and fascia. 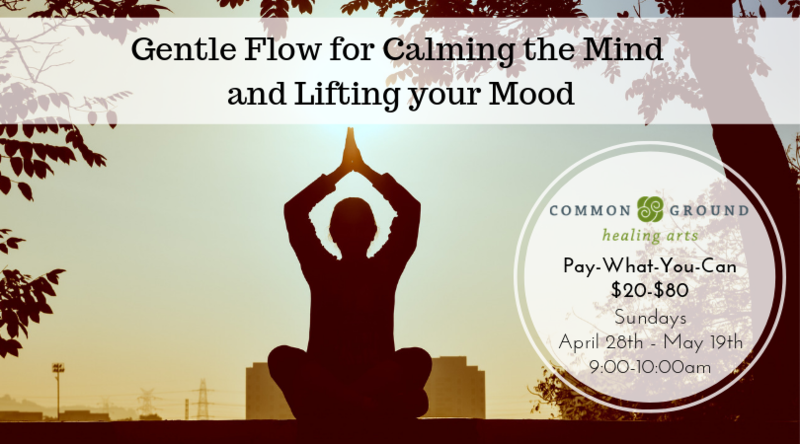 This calming, stress-relieving class offers a gentle approach to stretching and strengthening the body gradually through poses that are practiced at a slower pace. The experience will cultivate harmony between strength and flexibility, stability and mobility. An all-around great class for all shapes, sizes and abilities. Modifications/props will be offered. This course will be offered on Sundays, 9:00 – 10:00AM from April 28th – May 19th. This series will require a minimum of 10 people to be signed-up. If we haven’t hit the minimum we will contact those already signed up so that we all have chance to recruit a friend or two in the last few days! Next Next post: April C-ville Satsang: Have You Disappeared Into the Shadows of Your Life?